Fifth generation Breslov Chasid and founder of the Nanach movement. One of the earliest Breslev Hasidim to live in Israel, Rabbi Yisroel Ber Odesser (1898? - 1994) also known as 'the Saba' spent the full nearly 100 years of his life serving Hashem with all his might according to the teachings of Rebbe Nachman. At approximately age 24, Odesser claimed to have received a letter from Rebbe Nachman who had passed away 112 years earlier. This letter known as the Petek, contained the now famous phrase Na Nach Nachma Nachman Meuman. Towards the end of his life Reb Odesser founded the Na Nach movement. There is much controversy amongst mainstream Breslev and other Jewish Orthodox groups regarding the reception of the Petek and the message Rabbi Yisroel Ber Odeser claimed it contained. Yisroel Dov Ber was born in Tiberias, Israel in the year 1898 (approx.) to his parents Shlomo Isaac and Rivka Shindal Odesser. Tiberius of the late 19th century was a small city ruled by the Ottoman Empire like the rest of Israel. Tiberius at the time had a Jewish population of roughly 100 families. Most members of the community were followers of the Hasidk movement and descendents from the original migration led by students of the Bal Shem Tov. Initially settling in Safed, the Hasidim were soon forced to relocate to Tiberius due to opposition from the Perushim. During the ninth month of her pregnancy, Rivka Shindal Odesser went into sudden labor as she visited the community outhouse located at the outskirts of the city. With no one near the vicinity she helplessly gave birth to a child who fell into a pit of mud. As she was close to despair, an unknown man suddenly appeared and pulled the new born baby out of the deep pit. It was considered a great wonder that a man would be found near the women's outhouse, a location forbidden to men. Shlomo Isaac Odeser was a simple and religious man who belonged to the Karlin Hasidim. His father, Yisroel Ber was the leading judge of the Odessa Bais Din and a student of Rabbi Avraham Kalisker. When Rabbi Menachem Mendel of Vitebsk and Rabbi Avraham Kalisker moved to Israel, Yisroel Ber Odesser Sr. was part of the group. Rivka Shindal Odesser was a descendent of Rabbi Yechezkel Landau the Noda Beyehuda. Yisroel Dov Ber was named after his grandfather who shared the same name. 'Yisroel Ber' is a combination of the name of Rabbi Yisroel Bal Shem Tov, founding father of the Hasidic movement and his main student and successor, Rabbi Dov Ber the Maggid of Mezeritch. 'Dov' means 'bear' in Hebrew and 'Ber' is its equivalent in Yiddish. It was very common for European Jews to use both the Hebrew and Yiddish words when naming after an animal. Sometimes the two names are combined into one word 'Dovber'. Originally the family's name was Barzel but it was changed to Odesser for technical reasons to avoid the Ottoman government. Odesser is a reference to the city of Odessa, Ukraine where the family originated. Like many other Jewish families living in Israel at the time, the Odesser family lived in complete poverty. Shlomo Isaac, father of the Odeser family had become blind. Now besides not being able to support his wife and many children, he also became a financial burden for them. Their home was a small cave like structure built from thick stone, with no windows. Yisroel Ber and his family suffered greatly from the intense Tiberius heat. With meager earnings produced from coffee grinding, the Odesser family often had to go to sleep hungry. Yisroel Ber was a simple boy and was not especially intelligent, yet his soul yearned for the truth. Even in his youth, he would try his hardest to serve Hashem. From the age six, Yisroel Ber would attempt to fast and do Segufim, despite being naturally weak and under nourished. Amongst the Karlin Hasidim it was considered a great practice to yell out the prayers and Yisroel Ber would yell louder then anyone else. 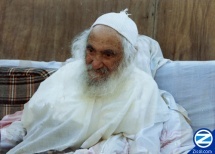 Despite his great poverty, Yisroel Ber would often give his only food away to an elderly couple whom he knew had none. Once he was beaten by his Melamed for not being able to concentrate after he had given all his food away as charity. At night, Yisroel Ber would scrape the remnants of the little oil found in his home and stay up to study Torah by the dim candle light. He did this with great sacrifice and suffered greatly for it. When they installed the first electric streetlights in the city of Tiberias, Yisroel Ber looked at it as merciful move from heaven in appreciation of his great sacrifice. From that night on, he would go down to the streets and study by the light of the electric lamps. Due to the poverty of his youth, Yisroel Ber was forced to sometimes work at a relative's bakery. It was here that he learned this trade and was able to use it a number of times in his life when he was faced with overwhelming financial pressure. Sipor Hiskarvus, the story of how R' Yisroel Ber Odesser came close to the teachings of Breslov is one of epics of the Nanachs. R' Odesser himself would recite the story numerous times, often to new devotes of the Breslev movement. Just like anyone else trying to enter the Service of Hashem, Yisroel Odesser had many hardships filled with spiritual ups and downs. In order to find effective methods to rid himself of the worldly lust, Yisroel Ber would seek the guidance of all the Rabbis, Kabbalists and respected elders that could be found in Tiberius. He would lower himself under them and complain about his spiritual woes. Although some of the Rabbis were able to give him temporary inspection, none were able to provide Yisroel Ber with the complete cure he needed to properly serve Hashem. After his bar mitzvah, Yisroel Ber was enrolled in the Hasidic Yeshiva located at the grave site of Rebbe Meir Baal Haness. Once while passing by the garbage bin in the yeshiva courtyard, Yisroel Ber found in it an old book called Hishtapchus Hanefesh which was missing the beginning and end. Although he did not know it at that point, Hishtapchus Hanefesh was published by the Breslev Hasidim which were considered a very controversial group at the time. Mountains around Rebbe Meir Baal Haness where the Saba would do Hisbodedus in his youth. Yisroel Odesser innocently read through the book which was a guide to Hisbodedute meditation, a free-form method of conversing with Hashem. Greatly inspired by the teachings in the book, Odeser started practicing the advice and techniques that it taught. He began practicing Hisbodedute in the fields around his Yeshiva and was greatly strengthened by the results he experienced. View of Kever Rebbe Meir from the Ashkanazi side. Once while reading his new-found book, Yisroel Ber was approached by a fellow Yeshiva student who was enraged to find his contemporary studying one of the forbidden books of Breslov. When Yisroel Ber refused to give up the book, the angry student forcefully ripped it out of his hands and took it away. Having the book taken away was a big loss to Yisroel Ber but by that point he knew most of Hishtapchus Hanefesh by heart and continued practicing the techniques mentioned in it. During the argument that prefaced the loss of his book, Yisroel Ber heard for the first time that there was a group called Breslov that had published the book. Armed with his new found knowledge Yisroel Ber now spent the bulk of his Hisbodedute time praying that Hashem send him a mentor from the Breslev Hasidim. Rabbi Yisroel Karduner was a fourth generation Breslov Hasid that lived in Safed. During the entire week, Rabbi Karduner would sit alone in Meron at the grave of Rebbe Shimon bar Yochi and do Avodas Hashem, it was only on the weekends that he would go home to his family. At was around this time that Rabbi Karduner suddenly started feeling great pains in his hand. So strong was the pain that it disrupted his Avodas Hashem. R' Karduner knew that the warm weather in Tiberias might ease the pain but strongly debated the wisdom of leaving Rebbe Shimon's Kever at he time he needed it the most. After much Hisbodedute on the matter R' Karduner received a heavenly sign indicating Tiberias to be the correct move and he immediately set off in that direction, despite it already being Thursday. Originally the Odesser family had supported itself as coffee grinders. World War One had brought about a severe shortage of coffee in Israel and the Odesser family was forced to start baking bread as a way to earn a living. At the time R' Karduner reached Tiberias, the Odesser family had only been in the bread baking business for one week. When he entered the city R' Karduner chanced upon Chai Binyomin Barzel a relative of the Odesser family. Binyomin Barzel had been the one to fund the baking operation for the Odesser family and happily led R' Karduner to their home when he asked for a good location to buy bread. Yisroel Ber Odesser was 17 at the time and was immediately impressed with the spiritual appearance of R' Karduner. Assuming R' Karduner to be one of the Lamed Vav Hidden Tzadikim, Yisroel Ber felt that his prayers had finally been answered. Afraid that his holy guest would soon walk off never to be seen again, Yisroel Ber was very surprised when R' Karduner asked if he could eat the bread in their home. Yisroel Ber considered it even a great divine intervention when his normally stern father agreed to the request. When the rest of his family had gone to sleep, Yisroel Ber approached R' Karduner and whispered in his ear that Hashem had sent him to Tiberias so he could save his soul. R' Karduner was very shaken when he heard this after seeing the divine providence that had lead him directly to Yisroel Ber immediately upon his arrival to Tiberias. As Yisroel Ber accompanied R' Karduner out of the house, he burst out crying and begged the older Tzadik not to leave him alone. He then told R' Karduner all about how he found the book Hishtapchus Hanefesh and how he was praying for a long time that he find some one who can guide him to the Breslev teachings. Yisroel Ber then continued to confess all his spiritual setbacks and problems. When R' Yisroel Karduner heard this he was became even more excited, he started telling the young lad all about Rebbe Nachman of Breslov, his books and his wondrous advice. These words penetrated deep into the heart of Yisroel Ber and he felt a cure like he had never felt before. Unable to find an open Beit Kneset they were forced to seek shelter in the ancient Beit Knesset of the students of the Bal Shem Tov. This Beit Knesset was founded by Rabbi Menachem Mendel of Vitebsk and Rabbi Avraham Kalisker and was located at the edge of the Kinneret, so its members could immerse in the Mikva when ever they wished. Each winter the Beit Kneset would flood from the rising waters of the Kinneret and all the books would be removed leaving the place abandoned with the tables half covered in water. R' Karduner and his new student entered the Bais Medrash and sat down on a table. After lighting some matches, Rabbi Karduner pulled out a Likutay Maharan Part 2 and and gave over lesson 7. So absorbed were they in their study that R' Karduner did not notice his ailing hand and the dampness of the Beit Medresh did not irritate them. It was only in the morning when they heard the frantic yelling of Yisroel Ber's mother that awoke to reality. Tiberias was a small city and when they heard the frantic cries of the worried Rivka Shindal Odesser, they inquired further. Rivka Shindal told over how an unknown Jew had appeared at her door to buy bread and had later ran off with her son only to be found in the abandoned Beit Kneset in the morning. Although Rivka Shindal did not know R' Karduner, the people of Tiberias recognized him very well as a Breslov Hasid. News was fast to spread that that night Yisroel Ber Odesser had been converted to Breslev. Word of Yisroel Ber's acceptance of Breslev was not taken to well by the Tiberias community. He was approached by a number of respected individuals who tried convincing him of the faults in Breslev. When they saw their words were falling on deaf ears and Yisroel Ber refused to budge from his convictions they decided to approach his father. A delegation of from the Yeshiva approached Shlomo Isaac Odeser and warned him that most Breslevers run wild in the woods and many of them end up insane. They warned him that this issue must be resolved now before it became to late to pull Yisroel Ber back. Shlomo Isaac Odeser was positive that his son would listen to him since he had never in his life disobeyed him. When Yisroel Ber returned from Yeshiva, his father approached him and told him he can pick any Hasidic group he wants besides Breslev. Yisroel Ber was already set on Breslev and responded to his father that on this point he refuses to listen to him. When he saw that his son had for the first time disobeyed his orders, he further believed the lies told to him about the Breslev Hasidim. Shlomo Isaac tried all he could to persuade his son to leave Breslev and when he saw no success he got up and kicked Yisroel Ber out of the house in middle of Shabbos. In the heat of the controversy Rivka Shindal approached Rabbi Mordechai of Slonim for advice of how to deal with her sons deflection to Breslev. R' Mordechai of Slonim was the chief Judge of the Tiberias Bais Din and had a close relationship with Yisroel Dov who had studied Mishna and Zohar under him. When R' Mordechai heard the story he confirmed that Breslev was very dangerous, claiming that it had a magnetic pull and all those who entered never came back. R' Mordechai then advised Rivka Shindal to approach R' Karduner and ask him to leave her son alone and with no mentor he was soon to go back to normal. Rivka Shindal approached R' Yisroel Karduner and prostrated herself in front of him, begging him to have mercy on the pitiful state of herself and her blind husband and to leave her son alone. R' Karduner patiently responded that he never pushed away anyone interested in serving Hashem and advised Rivka Shindal to let her son practice his beliefs in peace. These words had a drastic effect on Rivka Shindal, thinking that the Breslev spell had completely engulfed her son she had a heart attack, collapsing dead on the floor. Immediately Rivka Shindal was surrounded by medical experts from the community who tried everything the could to revive her. They tried pouring water on her and made use of potions and smelling salts, finally giving up on her as dead. R' Karduner and Yisroel Ber exited the room and started praying for to Hashem with all their hearts. Two hours later R' Karduner turned to his student and told him that their prayers had been accepted. They reentered the room and suddenly someone noticed Rivka Shindal blink her eye, suddenly she got up and exclaimed that she was not dead. There was much hate towards Breslev in the heart of the Tiberias community. To some of them Yisroel Ber's association to Breslov was almost equivalent to him converting to Christianity. When Yisroel Ber would walk in the streets people would cross to the other side as if he was a leaper, they would point fingers at him, mock him, throw stones at him and call him a wicked cruel murderer. From the most respected people in the city to the lowlifes they all joined to oppress Yisroel Ber. R' Moshe Karlis the head Rabbi of Tiberias issued an official Halachic ruling forbidding Yisroel Ber to remain Breslov. Rabbi Motil of Slonim the chief Judge of the city also ran a campaign against Yisroel Ber trying to force him out of his Breslev beliefs. Despite all the opposition Yisroel Ber remained strong in his beliefs and would not look at anyone or anything when it came to Rebbe Nachman of Breslev. Yisroel Ber Odesser spent five years studying under Rabbi Yisroel Karduner, until his mentor passed away during a plague in Tiberias. A bulk of this time period acured in the midst of World War One and the pair went through untold suffering and hardships as they served Hashem. Although he did not learn much Torah from his teacher. Yisroel Ber complexly received all the secrets of strengthening oneself in serving Hashem and finding the truth, the core of Rebbe Nachman's teachings. Seeing the great opposition that they were facing, Yisroel Ber was afraid that eventually he would be forced to separate from teacher. He approached Rabbi Karduner and asked him to make a handshake vow that they would never separate under any circumstances. R' Karduner agreed and they made a handshake vow over the Kever of Rebbe Akiva. They committed to always stay in the same city and to meet constantly to do Avodas Hashem and talk about Rebbe Nachman of Breslev. Luckily for Yisroel Ber Odesser he was engaged to Esther Mindel of Safed before he became Breslev, otherwise the chances of him getting married were slim. When Pinchas HaCohen, his future father in law heard news of his Breslev beliefs, he pushed them off assuming that Yisroel Ber would be easy to convince after marriage. Due to the financial difficulties caused by the start of World War One, Pinchas attempted to cancel the wedding claiming a lack of funds. Rabbi Karduner knowing how important it is for a person to be married according the teachings of Rebbe Nachman, went around and collected the money himself allowing the wedding to take place on time. Yisroel Dov Ber Odeser married Esther Mindel in the city of Safed in Elul 1915 (5675). After the wedding, Yisroel Ber and his wife moved into a small room alongside the home of Rabbi Karduner. Being married to Yisroel Ber was not easy and Ester Mindel had to undergo great embarrassment, suffering and poverty. Once she got wounded by a rock thrown at her head as she walked through the streets with her husband. Esther Mindel was devastated by the embarrassment and suffering she was going through and considered a divorce but decided against it after seeing her husbands great holiness and religious devotion. Tzvi Aryeh Rosental was a former student of the Chofetz Chaim that had relocated to Tiberius. He was considered one of the prime scholars amongst the younger members of the community and had studied a number of times with Yisroel Ber before he became Breslev. Tzvi Aryeh had always recognized Yisroel Ber as a seeker of truth and was very curious to know what he had discovered in Breslev that allowed him to withstand such immense opposition. Yisroel Ber introduced Tzvi Aryeh to his teacher Rabbi Yisroel Karduner and the latter was so impressed he decided to become Breslev himself. Unable to withstand the opposition that followed Tzvi Aryeh decided to escape to Jerusalem where he might practice his Breslev beliefs freely. When his family discovered his absence they summoned the Turkish police who arrested Yisroel Ber Odeser accusing him of kidnapping Tzvi Aryeh and sending him off to Uman. A Jewish deputy named Mordichi went as far as torturing Yisroel Dov to try and gain the whereabouts of Tzvi Aryeh. Soon afterwords this Mordechi justly received his punishment when he was accused by the Ottomen Government of being a spy and was shipped off to Turkey never to be heard from again. Grueling Avodas Hashem once were in Meron for over three days without eating or drinking. Would go to Meron which was desolate in those days where there were no food and fear of Arabs. Sometimes he would ask the Rashbi a question and then lean on the Tzion get an answer. When the British entered Tiberius a plague of Cholera broke out killing many of its inhabitants including all the children of the Karduner family. Rebbe Yisroel Karduner accepted the tragedy with great faith. In the end he said that he too would pass away and take the plague with him. As soon as he passed away the plague stopped but Yisroel Dov was left like an orphan without a father. After the death of Rabbi Karduner, R' Yisroel Ber Odesser was left completely alone, the only Breslever in Teberious. He continued practicing the same methods of Avodas Hashem that he had done until now with his teach, often traveling alone to the Rashbi. After the passing away of his teacher R' Yisroel Odesser felt very alone and had a dream portraying his constant spiritual struggle but how he would triumph in the end if he continued on the path of Rebbe Nachman. In the dream R' Yisroel Odeser was cast in midst of the sea with mountainous waves crashing all around him. Each time he was about to drown he was miraculously pushed just above the wave, leaving him barely alive. Relief was short lived since a new wave that threatened to drown him immediately replaced the first one. This went on until R' Yisroel Odeser noticed a tower in middle of the ocean. He was able to reach the tower and climb to its top floor. In his dream R' Odesser enter a hallway lined with doors and entered the last room where he was warmly welcomed by an old man with a very holy and charismatic presents. When R' Yisroel Odesser awoke he opened a Chayi Maharan in hope of gaining some clarification on his dream. Surprisingly he had opened to the exact section where Rebbe Nachman says that he will reveal himself to those that are worthy in the appearance of an old man. Elders of Breslev first met them at the Rosha Hashana kibutz in Meron with Rebbe Yisroel Karduner. After the death of his teacher he moved to Yerushalim to be around the elders of Breslov. Not able to afford an apartment he stayed as a guest at the home of R' Shlomo Wexler for a few weeks until he found his own place near the Breslov Bais Medrash in the Old City. During this time period of two and a half years until he returned to Teberious he lived off food that his neighbor brought him from a local soup kitchen. Passport photo before receiving the Petek. Rav Shlomo Eliezer Alpandri was the chief rabbi of Safed. On particularly cold winters he would come to Tiberias to immerse in the local hot springs. Rav Alfandri was considered a very holy Kabbalist by the Safardi community and the dedicated a room for him by the gravesite of Rebbbe Mair Bal Hanes. Yisroel Odesser who studied in the vicinity decided to use this opportunity to learn from this holy man. He approached Rav Alfandri and asked if he could serve him. Rav Alpandri saw that Yisroel Ber was earnest and he granted his request. After a few days Rav Alpandri happened to hear Yisroel Ber reading Likutay Tefilos with great devotion, very impressed with his level of Avodas Hashem he refused to let him serve him any longer. From that point on he considered Yisroel Ber as friends and refer to him with the prefix 'Rebbe' when he noticed that he was a man of complete truth that did not bend to anyone. Together they would study torah and talk about Avodas Hashem. When Rav Alpandri heard that Yisroel Ber only received a salary of two liras a week while the rest of the Kollel received 20, he was enraged. He angrily approached the heads of the Kollel and strongly rebuked them. From that point on the added an additional half a lira to his salary each week. Once Rav Alpandri was about to give an approbation to a Kabbalah Sefer, before doing so he let Yisroel Dov look at it asking his opinion. Yisroel Dov looked through it and found mistakes where it contradicts the teachings of the Ari. Rav Alpandri was thankful that Yisroel Ber had saved him from giving a haskama for the book. Their relationship continued until Rav Alpandri returned to Safed. There was a time where R' Odesser could no longer support his wife and children so they moved back in with her family and he went back to Tiberias. This changed when R' Motil of Slonim gave him the room. Would continue to go to the Rashbi by himself for weeks in a row. When occasional people would come he would enter the cave of Hillel so he would not be disturbed. Yisroel Dov Ber Odesser spent the bulk of World War Two at the grave of Rebbe Shimon bar Yochi in Meron praying for the salvation of the Jewish nation. Ironicly Hitler ended up committing suicide on Lag Baomer, the Hillulah of Rebbe Shimon Bar Yochi. Tikkun Klali by Kever of Saba. The Saba declared that he was completely clean of any ulterior motives such as money and honer and everything he did for the sake of Hashem himself. Rabbi Yisroel would run very far away from honer and would hide his greatness from anyone that he deemed to not be seeking the truth. The Saba spent his entire life to seek the complete truth and eventually he was granted this as a gift. Saba left over dozens of hours of recorded tapes. Saba would try to bring close both serious religious worshipers as well as the people furthest away. These included Shi Egnon, Martin Buber, Yitzchok Isick Zilberman and Zalman Shazar. First printing was done by Shazar himself. He once exclaimed that these letters will take over the world. Was located in Raanana and at approximately age 85 was taken out by Aaron Patz, Sharon Telzer, Alon Kaplan and Mair Yemini. Saba was in a wheelchair at that point. 18th (Chi) of Cheshvon. buried in Har Hamenuchos. At the funeral they sang Na Nach. His grave is visited by many people and might be the most visited one in the cemetery. Saba would always wake up and do Chatzot. So strong was his stand on Chatzot and it being a core part of Rebbe Nachman's teachings that he instructed in his will to leave the title Breslever off of his grave stone since there were a few times in his life that he missed waking up for Chatzot. Since Uman was opened up, the Saba went every year with the exception of the last Rosh Hashana of his life, 2 months before he passed away. One met a wolf, this was common to have wild animals all over the country before they were killed by the British. Another time he fell into a deep pit while doing hisbodedte in the pit there was a large snake, he yelled to Hashem and was saved after a few hours during which the snake did not harm him. A different time he was attacked by Arabs as he went to immerse in the Megido river but was saved when Shmuel Horowitz unexpectedly showed up. Saba Yisroel true to Breslov tradition avoided miracles since to him the main miracle was a person doing teshuva and starting to server Hashem. However those around him have many stories to tell of people that were cured by his blessings. According to Nanach tradition both the owners of Elite and Engles Bakery received their wealth due to his blessings. Would always care for his fellow breslovers before himself and helped many of them get apartments in the Old City of Jerusalem when he did not have one for himself. When a group of 25 Polish Breslover Hasidim immigrated to Israel in complete poverty, Rabbi Odesser did not leave the city of Yafa until he helped all of them get settled into the new country. R' Shmuel did not have any money when he first got married and was supported by the Saba for a few years. R' Mordechi Elazar Rubinstein faced a lot of opposition from his family when he first became Breslov. When the Saba heard he approached his father who was a famous Rav and after proving to him that he was more knowledgeable in Torah then he was himself, convinced him to leave his son alone. Saba said that he would give up his entire life to cause one person to have even one thought of repentance. Due to his Kiruv activities his children were kicked out of school. Likutay Emuna is a compilation put together by the Sabba on the topic of 'faith' from the various Breslov teachings. It was published by Keren Rabbi Yisroel Odeser, years after his passing, in a limited quantity. The kever of Rabbi Yisroel Ber Odesser is located in Har Hamenuchos, Yerushalim in Gush 11 Section 2. It is one of the most frequented kevarim in the cemetery, often visited by the Nanachs. Rabbi Yisroel Dov Ber Odesser is buried right next to his wife, who was buried there years earlier. The yortzite of Rabbi Yisroel Ber Odesser is on Chi (18th) of Cheshvan. Most Nanachs try to make a pilgrimage to his kever on that day. There are a number of Hafatza stands set up around the Hillulah and often food and drink is given out.